UPDATE: Pure's FlowSongs music service offers MP3 downloads from the radio | What Hi-Fi? The beta version of Pure Digital's new FlowSongs music service has gone live today after a slight delay. At launch, more than 85% of 7digital's music catalogue is available to FlowSongs customers to buy, stream or download. However, a small minority of rights owners are still considering the rights issues associated with the secure streaming of legally purchased content and while doing so have opted out of the service. Pure says: "We respect the rights of all content owners and continue to talk to those who are yet to approve the [FlowSongs] service. "Our intention is to build a music service which enables radio listeners and music fans to hear, buy and love more music legally, and for the artists and labels to receive remuneration for their work." Pure Digital has teamed up with Shazam and 7digital to launch a new cloud-based music service, FlowSongs, which allows listeners to identify and buy songs they hear on the radio – be it on DAB, FM or the internet – without having to connect it to a computer. 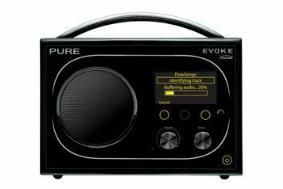 The system can identify tracks playing on any radio station and allows the user to buy them directly from any Pure radio with Flow technology built in. That includes the Pure Evoke Flow, Avanti Flow, Oasis Flow, Sensia or Siesta Flow. The beta version of the service launches in the UK on Monday, August 16th and will be rolled out internationally later this year. It's simplicity itself to use. If you hear a song you like on the radio, just press the 'Flow' button and the name of the track will appear on the display. If it's available to buy, you'll also see the price displayed (usually from 79p to £1.29), then all you have to do is press the 'Buy' button and the song will be downloaded to your account on Pure's portal, The Lounge. You can replay the song any time you want by streaming it from The Lounge on your Pure radio, or download it to a PC, Mac, iPhone, or other mobile device. All the tracks are DRM-free and stream at 128kbps. Most are high-quality 320kbps files when downloaded. 7digital has about half a million tracks licensed for the UK, and anyone who registers for the FlowSongs service will get a free 90-day trial subscription allowing them to tag as many tracks as they like (although a credit or debit card will be needed to purchase tracks). After the 90-day trial expires, there's an annual £2.99 subscription. Pure's marketing director, Colin Crawford, says: "FlowSongs is a unique and easy-to-use cloud-based music service that delivers a bridge between radio, which is the most popular way of discovering new music, and the ability to own that music." We've been given an account to trial the system from Monday when the software becomes available, so we'll let you know how we get on.